This topic contains 2 replies, has 3 voices, and was last updated by msidorsky 2 months, 3 weeks ago. 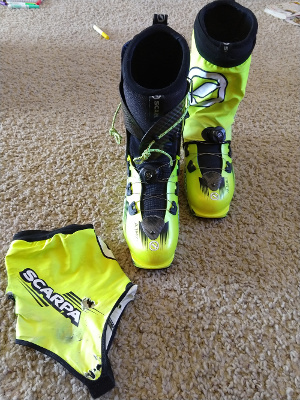 I am selling my Scarpa Alien 1.0 boots. They are a size 28 and are in great shape. This boot is incredible. It is super light and comfortable and races well both on the uphill and the downhill. They come with the lycra gaitors which are not in the best shape but they still work. I am in Truckee, CA and will ship the boots if you want me to.